There are different types of automatic rice cookers with varying capabilities. Each type of cooker has the capability of preparing certain types of rice and other foods. Some units have a lot of extra features while others have just the basic functions. The most popular kinds are those that cook the rice and then shutoff or ones that cook the rice and then when the rice is cooked, the machine keeps it warm. Technological advancements have produced rice cookers that have induction induction heating technology and those that have a combination of induction heating and pressure cooking. Induction heating is a method whereby a magnetic field is produced when an electrical current passes through the copper coils. The pan of the rice cooker is the heating element. This is in contrast to those that only produce heat from the heating plate that is on the bottom of the rice cooker. The induction method allows the inner pan to heat up evenly, producing uniformly cooked rice. It also makes instantaneous changes to the temperature, and cooks the rice more thoroughly. This results in tastier and fluffier rice. An induction pressure cooker selects appropriate pressure and adjusts the cooking time for the rice based on the menu selection. We review two induction heating rice cookers and three induction pressure rice cookers. Best Induction Rice Cooker F.A.Q. Is an Induction Heating Rice Cooker Worth It? What Is an Induction Rice Cooker? What Else Can I Cook in an Induction Rice Cooker? Is an Induction Heating Pressure Rice Cooker Faster? Zojirushi has been manufacturing high quality kitchen related products for 100 years. Their rice cookers are popular due to their cutting-edge technology, durability, quality and affordability. A wide range of rice cookers is available and priced according to the type of features offered. The Zojirushi Induction Heating Pressure Rice Cooker & Warmer 1.0 Liter, Stainless Brown NP-NVC10 is a model that just might fit your cooking needs. As cliché as it may sound, this really is a top of the line rice cooker. Perfect rice can be cooked thanks to the artificial intelligence and the heating and pressure cooking technology. Induction technology is the heating system used in this Zojirushi NVC 10 rice cooker. A magnetic field is produced when electrical current passes through the copper coils making the pan the heating element. This allows the inner pan to heat up evenly, producing uniformly cooked rice. The cooker then chooses the appropriate pressure and adjusts the cooking time for the rice based on the menu selection. This Zojirushi Induction Heating Pressure Rice Cooker provides a vast array of menu cooking functions. The most popular settings are white, brown, mixed, GABA brown, sushi/sweet rice, porridge, and quick cooking. The Umami setting soaks and steams the rice longer and is said to produce rice with an extra delicious flavor. If you prefer rice that cooks up firm, then the steam-reduce setting would be beneficial as it reduces the steam to 50% of the regular setting. The rinse-free setting is used for preparing rinse-free rice and automatically adjusts the cooking time and temperature. The scorch setting is useful for those who enjoy preparing fried rice dishes as it lightly toasts the rice. Cooking GABA rice (germinated brown rice) is becoming more popular as possible health benefits are reported. The temperature on this setting is 104°F, held there for two hours after which the rice cooked at the programmed time and temperature. Three warming options are available on this cooker. The Regular Keep Warm function keeps the rice warm and fresh for up to 12 hours. If you need to keep the rice warmer for longer than 12 hours, the Extended Keep Warm mode can be activated and used for more than 24 hours. The Keep Warm Monitor emits a reminder to loosen the rice 10, 40 and 70 minutes after the rice is cooked. This Zojirushi induction pressure rice cooker has a nonstick coating infused with platinum particles. The theory is that platinum makes the water more alkaline. This alkalized water breaks down the protein on the surface of the rice grain. Once this happens, water can more easily penetrate the rice grain and react with the starch inside the rice grain. This leads to more gelatinization and a sweeter tasting rice. There is no longer the chance of serving hard, overcooked rice when rice is prepared with this induction pressure rice cooker. The micro-computer is programmed to cook rice at the perfect time and temperature while also making adjustments during the cooking process. The result is perfect, uniform, thoroughly cooked rice each time. Despite the number of settings, this unit is really very easy to operate. Measure the rice with the appropriate measuring cup included with the cooker, place the rice and water (see manual for amounts) in the cooker, close the lid, and press the button for the menu you want (brown, white etc). There is no time spent calculating the right time and temperature or making adjustments during the cooking process. The main drawback of this induction heating pressure rice cooker is that it is expensive. 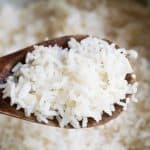 However, if you want a natural tasting rice that is cooked perfectly each time and enjoy a variety of rice grains, then it is certainly worthy of consideration. Another downside is that it really only cooks rice effectively. 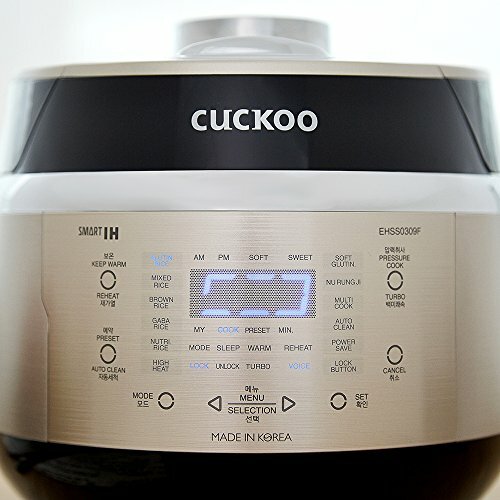 For years now, the Cuckoo brand has been known for its innovative technology and reliable rice cookers. 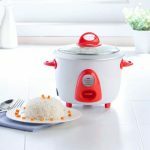 It’s no surprise that this Cuckoo Electric Induction Heating Pressure Rice Cooker made it on this list because quality can’t be left out. This 110Volt/ 60Hz, induction heating pressure cooker utilizes fuzzy logic and an intelligent cooking algorithm. Rice is thoroughly and evenly cooked. As temperatures are preset for the type of rice being cooked there are no calculations needed. The nonstick inner coating is XWall Diamond while the outer is the durable and scratch resistant Titan Extreme Titanium Coating. A welcome feature is the night time volume reduction. It can be set to zero volume or 20%, 40%, or 80% of the daytime voice volume. Although the navigation voice is Korean (select either a man or woman's voice), the manual for the CRP-HS0657F is in both English and Korean. 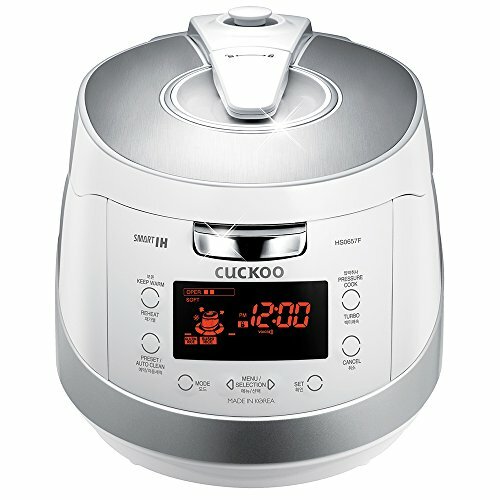 This ​Cuckoo induction pressure rice cooker is manufactured in South Korea. Cleanup is very easy as the stainless steel inner pot can be placed in the dishwasher and the inner stainless steel lid is removable. The second Cuckoo rice cooker on the list is the Cuckoo Electric Induction Heating Pressure Rice Cooker. The model number for this unit is CRP-EHSS0309FG. This 3-cup Cuckoo induction heating pressure rice cooker uses the latest technology to make sure your rice is cooked perfectly. It detects the grain type and determines the best temperature and cook time. The induction heating feature is convenient as the dishes are prepared quicker than non-induction rice cookers. This cooker has a ventilation system, X-wall stainless inner pot, a light blue LED with touch select, and voice navigation in Korean, Chinese and English. The user manual for the CRP-EHSS0309FG is also written in these three languages and is an informative and detailed manual. As with the previously reviewed Cuckoo IH Pressure Rice Cooker, this unit also has a night voice volume setting. It can be set from 10:00 PM to 5:59 AM to either OFF or at a level from 1 to 5. Mid-way through the rice cooking process, the rice cooker makes a snake-like sound, which gives the impression that something is wrong with the appliance, or with the cooking. However, this is completely normal. Any type of rice can be cooked in this Cuckoo Induction Heating/ Pressure Rice Cooker which is one of its main highlights for me. The cooking time for brown rice is reduced, and there doesn't seem to be a need to soak it beforehand. The multiple settings allows for choosing the desired density of the rice and the non-stick inner pot makes it a breeze to clean once finished. The voice navigation makes it easy to follow, and its compact design is a great addition to the kitchen without taking up too much room. If you only plan to cook white rice, the price tag is a bit high, but for avid rice cookers, the price is right. The next model on the list, the Zojirushi NP-GBC05XT Induction Heating System Rice Cooker and Warmer , has the features of a high-end induction rice cooker at an affordable price. This 3-cup rice cooker and warmer is a good match for a one or two-person household. One-half to three cups of uncooked rice can be prepared using any one of the many menu settings. For those who don’t want or need a pressure cooker function, this Zojirushi induction heating rice cooker is worth considering. The technology and design allows for precise temperature control. This model has a micro-computer chip that is programmed to make adjustments to both the temperature and the heating time. This Zojirushi IH rice cooker weighs about 8 pounds and has dimensions of 9 1/8 x 11 7/8 x 7 1/2 inches (W x D x H). 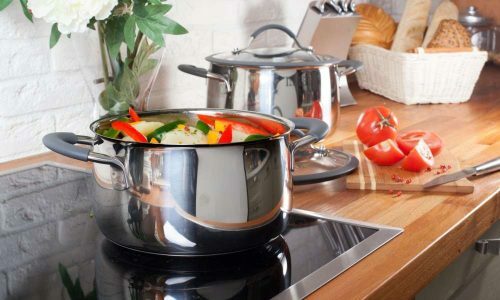 The inner cooking pot is made of thick stainless steel/aluminum with a nonstick coating. There are markings engraved on the inner pan that show how much water to add for each half cup of uncooked rice ranging from ½ to 3 cups. The markings are: sushi, brown, white rice/mixed rice (max 2 cups). Along with the rice cooker a rice spatula, spatula holder and two rice measuring cups are provided. Be sure to use the measuring cups included with your cooker to measure the uncooked rice. The green cup is used to measure rinse-free rice and the clear cup for rice that is to be rinsed. It is important to use a non-stick spatula so as not to scratch the inside of the inner pan. The U.S. model has a detachable cord. Induction heating technology is used in the Zojirushi NP-GBC05XT. In this type of heating system, electrical current is passed through the wire of the coils (copper) to generate a magnetic field. The entire inner pan (bottom, sides and lid) then heats up evenly, resulting in uniformly cooked rice. This is in contrast to rice cookers in which the inner pot is heated only from the bottom up. This process is to be used with rice that needs to be rinsed. Measure the rice with the clear measuring cup provided. Place the inner pan on a level surface. Add the rice. Add water to the level according to the menu selected. Place the inner pan into the cooker. Close the lid and plug in the power cord. Press the menu button until the desired selection is reached. When cooking is completed, a melody or beep will sound. Stir and loosen the rice immediately so it will have a fluffy texture. When finished using, press the reset button and unplug the power cord. Measure the rinse-free rice with the green measuring cup provided. Add enough water to cover the rice. Gently stir 2-3 times to separate the grains. Add water to the correct marking (use white rice water level). The timer function on this rice cooker can be set to automatically finish cooking by a specified time. The time appears in the 24-hour format (military time). Once the timer settings are entered into the cooker, they need not be set again if the same settings are going to be used. Before using the timer, be sure the clock is set to the current time. The timer can be used in conjunction with these menu settings: white, brown, GABA brown, rinse-free, sushi and porridge rice. Set the TIMER for less than 13 hours (8 hours for rinse-free rice) to prevent the rice from spoiling – especially during summer. 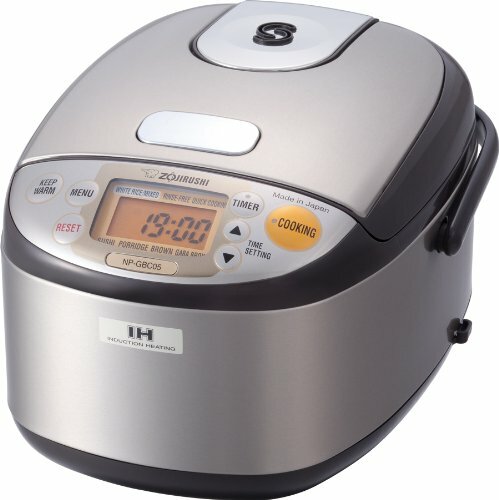 This Zojirushi rice cooker has two timers that can be pre-set for any time you desire. For example, one timer can be pre-set, so the dish will be finished by 12:30 pm; while the other timer can be pre-set, so the cooking will be completed by 18:30 pm. The TIMER button is used to select either “Timer 1” or “Timer 2”. 1. Press the TIMER button and select “Timer 1”. A 24-hour time setting appears. The initial setting for “Timer 1” is 6:00. The COOKING light will start flashing. 2. Press the MENU button to select the desired Menu feature. 3. Adjust the time using the up and down arrows (the time will change in 10-minute increments) until the clock shows the desired time. 4. Press the COOKING button. The COOKING light will turn off. The pre-set time will appear. 1. Press the TIMER button and select “Timer 2”. A 24-hour time setting appears. The initial setting for “Timer 2” is 18:00. 3.Adjust the time using the up and down arrows until the clock shows the desired time. This 3-cup Zojirushi rice cooker automatically goes into keep warm mode after the rice is fully cooked. The small indicator light on the keep warm button appears. The LCD display also shows how many hours the rice cooker has been in keep warm mode. Press the KEEP WARM button to cancel the warmer function. The Zojirushi NP-GBC05XT Induction Heating System Rice Cooker and Warmer is versatile, compact, convenient, and user-friendly. The multiple menu settings offered allow for the preparation of a variety of dishes. The delay timer is a convenient feature as it can be programmed to have your meal ready at the time you choose. It is especially useful if you want to cook steel cut oatmeal since the timer can be set at night and the oatmeal will be ready for breakfast. When cooking is complete, the unit switches to the Keep Warm mode and can keep rice warm up to 8 hours. It is easy to clean (hand wash) since the stainless steel inner lid, steam vent, and inner pan are removable. The exterior of this unit is clear coated stainless steel making it easy to wipe and buff. The main highlight for me though, is that it is very easy to use especially having the water level markings on the inner pan. The advancements in technology have made some appliances so complicated that some people find it just isn’t worth the effort. That is not the case with this product. While technology such as induction heating and micro-computer chips are used in this model, the unit is user-friendly. In addition, the user manual is very detailed, includes recommended cooking times and recipes. It is available online and one is also shipped with the rice cooker and accessories. The only part of the manual I found confusing was their description of the timer and how to set them. Therefore, I included detailed instructions on how to use this feature. My main complaint about this Zojirushi Induction Rice Cooker and Warmer is that the lithium battery is soldered onto the circuit board. If it has to be replaced, the services of a professional electrical repair person are required. If the unit is under warranty, it has to be replaced at a Zojirushi service center or the warranty will be voided. Unless you live in a city with a service center (Torrance, CA, San Francisco, CA, Oceanside, NY, Redmond, WA, Anchorage, AK, and Honolulu, HI), and can take the unit to the repair center, the consumer bears the shipping costs both ways. If the rice cooker is not under warranty, then the consumer has to pay for the parts, labor, and shipping if they want Zojirushi to replace the battery or take it elsewhere and pay for the parts and labor. Many people choose a Zojirushi product because of the brand name. They know they are getting a durable and quality product and one that is manufactured in Japan. 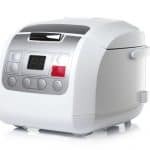 The technology and materials used in the design and manufacture of this Zojirushi rice cooker makes it possible to produce flawlessly prepared rice dishes each and every time the unit is used. The Zojirushi NP-GBC05XT Induction Heating System Rice Cooker and Warmer makes perfect white or brown rice for a one or two-person household. If your family is larger and you want an induction Zojirushi model, there are units available that have a larger rice capacity. This Zojirushi rice cooker would be a nice gift for young people who are living in a dorm room or apartment as it doesn’t take up a lot of space. They can prepare the meal, set the timer and it will be ready after class or work. Many consumers have found the upfront expense for this induction heating rice cooker to be worth it. This is especially true for those who eat rice frequently and appreciate perfectly cooked rice. 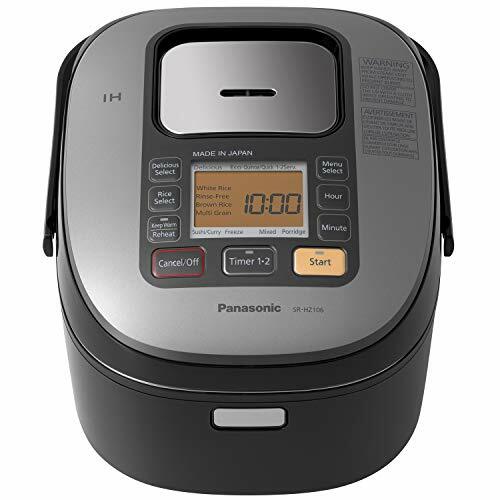 This Panasonic Rice Cooker & Multi-Cooker SR-HZ106 is the only Panasonic on the list, but it made it for a good reason. We selected it because it is well-built, versatile and offers 13 pre-set cooking options. 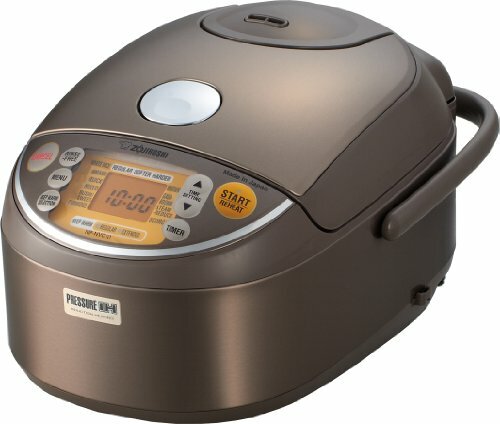 This top-tier rice cooker, from a brand with a solid reputation, would be a valuable addition to any kitchen. Panasonic developed its first induction heating rice cooker in 1988 and new models continue to evolve. Since then, new rice cookers have been rolled out in 1995, 1997, 2003, 2008, and 2016. The 5 cup (uncooked) SR-HZ106 Panasonic rice cooker is aesthetically pleasing and would look great in any kitchen. Its versatility is evidenced by the 13 pre-set menus. The electrical requirements are 120V/15 amps. This unit is manufactured in Japan. 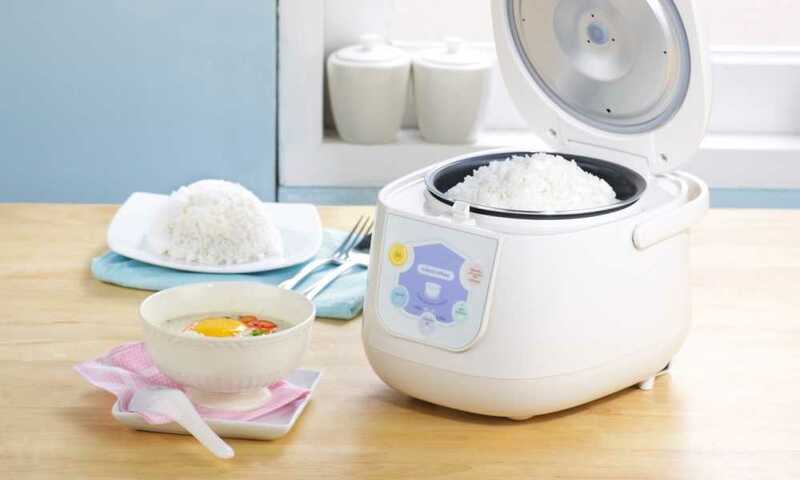 A rice scoop, ladle, measuring cup and rice scoop holder is included with this Panasonic Rice Cooker. The inner pan has 7 layers which provides heat control and ensures perfect, evenly and thoroughly cooked rice. The coating is durable and non-stick. The innermost layer is a Japanese crafter diamond finish, followed by tough ceramic, primer, aluminum alloy, stainless steel, insulation and the outer layer is golden insulation. These are of water level markings on the interior of the inner pan so the correct amount of water can be added for the number of cups of rice. The manual has a table that correlates the setting to the water level. There are 5 layers of induction heating: lid, upper side, center, lower side and bottom. There are four rice options: white, rinse-free, brown and multigrain. After white or rinse-free rice is selected, additional cooking options are available. The keep warm function is activated once cooking is finished and can be used for up to 12 hours. The reheat feature (rice is heated to a high temperature) can be used when the keep warm function is activated. It cannot be used to reheat cold rice. Two timers can be set in all settings except with the Quinoa/Quick or Mixed settings. When cooking with the timer, the time until the rice is ready is not displayed. There is a lot about the Panasonic Induction Heating System Rice Cooker that I like. The three major selling points are the 7 layers of materials that comprise the inner pan, the 5 layers of induction heating and the multitude of menu options. The 13 pre-set menus to cook rice make it easy to press a button and walk away, while the warming feature keeps the rice from getting cold. Buyers of this rice cooker remark that the five layers of induction heating cook the rice thoroughly and in a short time period. The easy-to-use LED and included utensils are a bonus. Before purchasing an induction rice cooker, it’s good to understand what features are important to you. Generally, induction cookers do cost more than the standard rice cooker, but if you cook a lot of rice on a frequent basis, it might be cost effective to purchase one. All induction rice cookers are going to provide the specific amount of heat that’s required for your desired choice of rice. Induction heating works by using an electrical current to heat the plate inside of your rice cooker. The intensity of the heat is going to depend on the amount of rice you’re cooking, and the type. 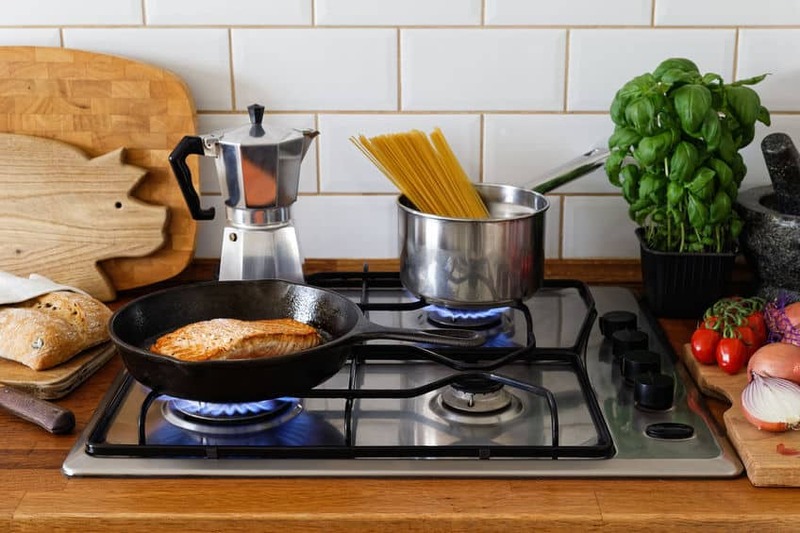 Depending on how much space you want to take up in your kitchen or where you’re storing the cooker, you might want to seek one that’s smaller. If you only eat rice occasionally or are cooking for one or two people, a three cup, compact induction heater would prove to be more beneficial than a ten cup cooker. Typically, the more cups of rice it fits, the larger the rice cooker. The majority of standard rice cookers have a simple one-touch control while induction cookers appear to be more complicated. Even though there are more options, you should look for a rice cooker that has controls that are straightforward, easy to use, and without complications. You should only need to consult with your manual a couple of times to thoroughly understand how it works. Quick-cook functions on induction rice cookers make it so you can pour in your rice, water, and go. The models get designed to provide ample amounts of heat to cook a specific type of rice in a pre-determined time period using smart induction algorithms. This feature is commonly used for white rice, jasmine rice, and oatmeal. The benefit of having an induction heating rice cooker is to ensure that you get even heating all around, instead of just at the bottom. The features and design ensures that your rice is cooked according to your specific settings each time. Additionally, induction heating rice cookers are known for their ability to prepare brown rice not just thoroughly, but in a lesser amount of time. 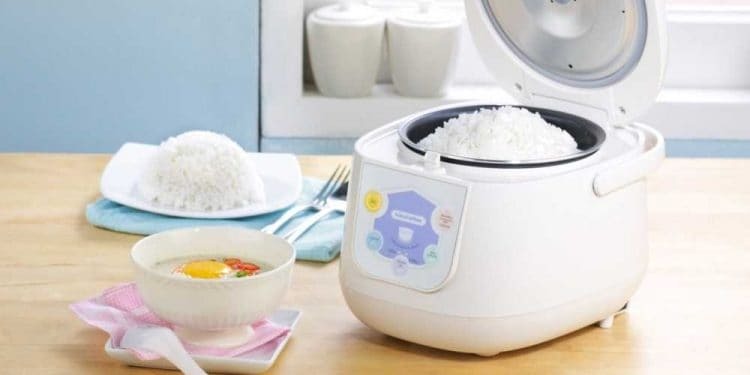 For individuals, couples, and families who live a busy lifestyle, this type of rice cooker could be beneficial. Induction heating is a technology that’s becoming more popular, and consumers are choosing this method for not only their rice cookers but a variety of kitchen appliances. Typically, induction rice cookers work the same way as regular cookers, except they use a magnetic field that produces a heat-generating current once the pan is inserted. This causes the heat to distribute evenly instead of focusing the majority of it on whatever is at the bottom of the pan. Standard rice cookers cook the rice from the bottom up, whereas induction cookers spread the heat evenly throughout with induction technology. The heat seeps through to the center to cook perfect, fluffy rice each time. The majority of models that feature induction technology also provide a warming feature that keeps rice fresh. The induction technology used in the rice cookers enables you to cook a variety of food outside of rice. Depending on the model, you can also steam vegetables, fish, cook oatmeal and porridge, and some even have settings to bake different types of bread. There is also the possibility of slow cooking soups and stews as well as some meats, such as ribs. The owner’s manual that comes with your rice cooker should outline what you can cook with your model. Yes. 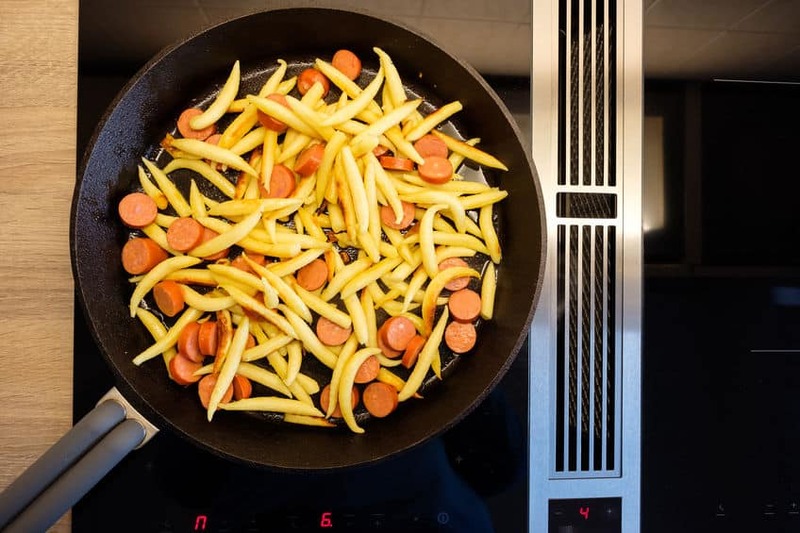 Because induction and pressurized cooking spread the heat evenly around the food you’re cooking, it often minimizes cooking time by half of the standard time. What Can I Cook with a Rice Cooker?